If you are looking for Family Ornaments, also designed by Peggy, click here. 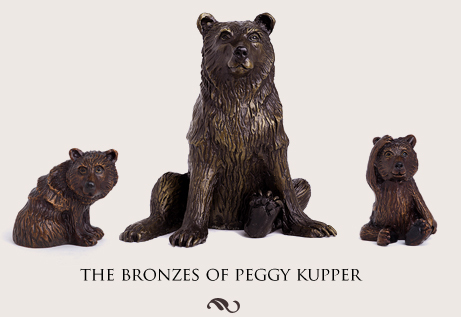 Welcome to the showcase of Peggy Kupper's bronze creations. Her recent foray into bronzes has produced a number of limited edition sculptures of bears, moose and dogs. You can find images of these sculptures in the Gallery. In addition, you will find further biographical information on Peggy in her artist profile. Though skilled in bronzing, her fame has been acquired through years of sculpting and designing figurines and ornaments for Mother Moose and Company. Through Mother Moose, she has sold millions of ornaments nationwide.